CAPSULE REPORT: For people who have difficulty taking calcium the regular way—dairy foods or pills—there’s Adora, dark and milk chocolate disks with 500mg of calcium “hidden” inside. They’re tasty too. At 30 calories and 2 grams of fat apiece, those who now drink their milk or swallow a tablet might make excuses to convert to two or three pieces of Adora a day. Lots of people need more calcium and just don’t take it. According to a survey of 1,158 women conducted by Thompson Brands, producers of Adora, the overwhelming majority correctly identify 1000 mg as the daily recommended intake (women over 50 years of age need 1200 mg). Yet, they don’t take it in. Why? 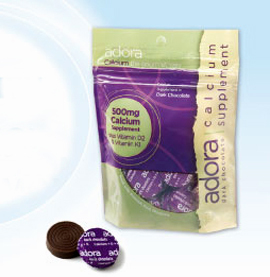 Seeing an opportunity to provide a tasty solution to a widespread problem, Thompson created Adora, a gourmet chocolate calcium supplement—“gourmet” because it provides a much higher chocolate experience than chewable drugstore calcium supplements. By eating just two dark chocolate or milk chocolate disks a day*, or 60 calories worth of chocolate, you get your 1000 mg of calcium and a chocolate fix too. In addition to 500 mg of elemental calcium, each piece has 100 IU of vitamin D and 40 mcg of vitamin K, which enhance calcium absorption. *Each piece has 30 calories and 2g-3g of sugar. People over 50 years of age need 3 pieces. Sixty calories is a caloric bargain. Unless you swallow two or three large pills, the fastest way to consume 1000 mg of calcium is to drink close to three 8-ounce glasses of milk or soy milk, each of which has 400 mg of calcium, or 50 mg per ounce. Even drinking nonfat milk at 11.25 calories an ounce totals 225 calories. How “gourmet” does Adora taste? Adora doesn’t claim to be gourmet chocolate—just “calcium the gourmet way.” While it wouldn’t pass as gourmet chocolate, it tastes as good as many chocolate products sold at the newsstand. It doesn’t taste in the least medicinal, chalky or like anything other than chocolate. No one would know there are 500 milligrams of calcium, plus vitamins D and K, inside. Have it with a cup of coffee or tea instead of chewing it alone, and it will taste even better. †Source: U.S. Department of Health and Human Services. Enjoy your chocolate calcium supplement—your healthcare provider approves, and might enjoy a bag! The products are also sold at Target, Walgreen’s, Whole Foods Markets and other retailers. Suggested retail price, $7.99 per 30-piece bag.